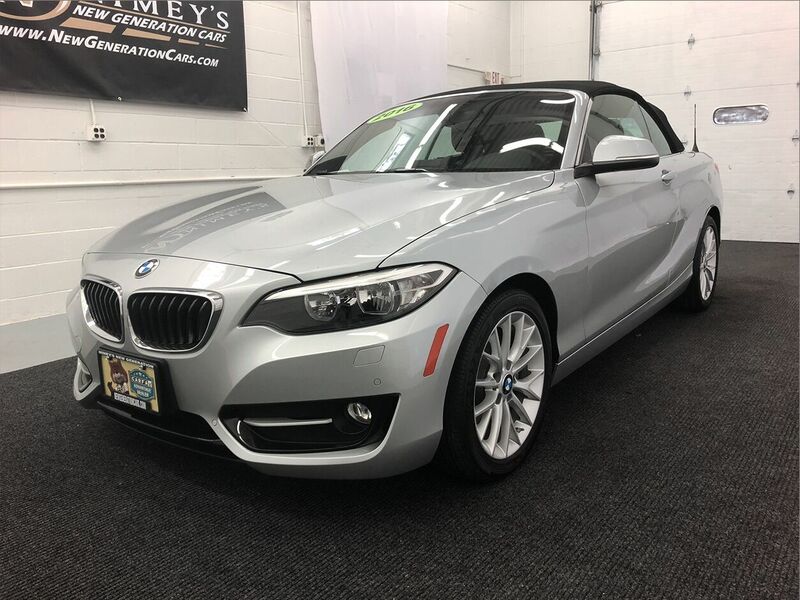 Designed to push the limits, our 2016 BMW 228i xDrive Convertible is a knockout in Moonlight Silver! Fire up the 2.0 Liter TwinPower TurboCharged 4 Cylinder and unleash 240hp via the responsive 8 Speed Automatic transmission that helps you down the road with ease. You'll soar to 60mph in just over 5 seconds and attain near 35mpg on the open road while enjoying a smooth ride and the tenacious traction of All Wheel Drive. Our 228i xDrive Convertible is sure to turn heads with its classic lines and wicked-fast soft top. Comfort reigns supreme inside our 228i with upscale amenities such as automatic headlights, rain-sensing wipers, automatic dual-zone climate control, and 8-way adjustable heated sport seats. Staying in touch is easy and safe thanks to our iDrive interface central display with Bluetooth connectivity and a premium sound system with a CD player, HD radio and a USB/iPod interface. Our BMW 228i Convertible is pure open-air fun but also surrounds you with meticulously designed advanced safety features including airbags and a rearview camera to keep you safe from harm. Power, performance, and prestige can be yours when you get behind the wheel of this impressive 228i! Print this page and call us Now... We Know You Will Enjoy Your Test Drive Towards Ownership! Roomy and refined, our 2016 BMW X1 xDrive28i looks better than ever in Mineral Grey Metallic! Powered by a TurboCharged 2.0 Liter 4 Cylinder that offers 228hp while paired with a responsive 8 Speed Automatic transmission to provide sharp handling and a smooth ride. Pairing quickness and efficiency, our All Wheel Drive X1 gets to 60mph in just over 6 seconds and delivers an impressive 32mpg on the highway. Our BMW X1 xDrive28i elevates your style with its unique silhouette that is accented by great-looking alloy wheels. Inside our X1, elegance and comfort reign supreme inside with keen attention to detail. The iDrive electronics interface, Bluetooth phone connectivity, and an 8 speaker sound system with HD radio are all amenities that keep you feeling confident and in control behind the wheel. You'll relish in the comfort of 8-way adjustable seats with premium seating as you enjoy such amenities as dual-zone automatic climate control and automatic headlights. Experience the exceptional athleticism of our 2015 BMW 435i xDrive AWD Coupe on display in Mineral Grey Metallic. Powered by a TurboCharged 3.0 Liter 6 Cylinder that offers an enthusiastic 300hp while paired with an 8 Speed Automatic transmission with steering wheel-mounted paddle shifters. This stellar All Wheel Drive combination takes our sure-footed Coupe from zero to 60 in under 6 seconds and offers marvelous efficiency of near 32mpg on the highway. This desirable masterpiece gives new meaning to the art of driving with precise steering, a responsive suspension, and a low center of gravity. The debonair appearance of our sleek 435i Coupe is accentuated by adaptive xenon headlights and unique 18-inch alloy wheels. Open the door to the masterfully crafted 435i interior with rich high-end materials and notice that in typical BMW fashion, amenities and options abound to make this your personalized ride. Slide into ultra-comfortable 8-way power adjustable seats finished in red and admire the view from the sunroof or stay in touch with your digital world with the iDrive interface, navigation, Bluetooth, and a deluxe sound system. Safety surrounds you in our BMW with advanced features that have been meticulously designed. Once again, the BMW engineers have crafted a piece of automotive art that you've got to see to believe. Don't deny yourself this experience. Print this page and call us Now... We Know You Will Enjoy Your Test Drive Towards Ownership! Take a look at our 2014 Acura RLX sport sedan, shown in a brilliant Crystal Black Pearl. It is the ideal vehicle for romantic getaways, conjuring images of donning your sunglasses and zipping off to exciting destinations for the weekend. Powering this machine is a 3.5 Liter V6 that produces 310hp on demand while tethered to a smooth-shifting 6 Speed Automatic transmission. With this combination of our Front Wheel Drive, it delivers an impressive 31mpg on the highway. Experience supreme handling during any road conditions, wherever you may be going in this sleek looking Acura RLX. Offering a fresh and appealing look, our Sedan will impress you with its elegant and spacious interior. With standard features like Bluetooth, heated leather front seats, keyless entry and push button start, you will feel like you are riding in style every time you get behind the wheel. There are numerous other features to come and discover inside and out of this RLX. Even mundane errands won't feel like such a chore with this Acura RLX. In a rapidly evolving marketplace, Acura believes in keeping up to date with safety and security expectations. You will appreciate all of Acura's standard safety features such as the unique body structure design, an army of airbags, vehicle stability assist, security system and so much more! Print this page and call us Now... We Know You Will Enjoy Your Test Drive Towards Ownership! Our award-winning One Owner 2016 Honda CR-V SE AWD SUV in White Diamond Pearl is a smart choice that you're sure to love! Powered by a 2.4 Liter 4 Cylinder that offers 185hp connected to a CVT with a sport mode that offers great passing. Reward yourself with this All Wheel Drive with near 31mpg on the highway. An ideal balance of size and capability, our sure-footed CR-V is ready to take on whatever your lifestyle requires even when road conditions are less than ideal. With clean simple lines and sophisticated styling, our CR-V SE has classic good looks you will appreciate. Open the door to the spacious interior of the SE and enjoy a wealth of amenities including Bluetooth HandsfreeLink and Streaming Audio, SMS Text message function, a great audio system and Pandora compatibility. An illuminated steering wheel with cruise, audio, phone and i-MID controls keeps power at your fingertips. Of course, with massive cargo space, 60/40 split rear seats, and rear privacy glass, the CR-V can handle your family and everything they need for their many adventures! Honda boasts excellent safety scores thanks to advanced capability engineering, vehicle stability assist with traction control, excellent outward visibility, and an army of airbags, this CR-V also provides you with priceless peace of mind. Get behind the wheel and begin your newest adventure today! Print this page and call us Now... We Know You Will Enjoy Your Test Drive Towards Ownership! The benchmark of automotive perfection, our 2015 Mercedes-Benz C-Class C300 Sedan in Steel Gray Metallic is going to exceed your expectations! Motivating our world-class sedan is a TurboCharged 2.0 Liter 4 Cylinder generating 235hp while paired with a responsive 7 Speed Automatic transmission. Our Rear Wheel Drive Sedan delivers a satisfying driving experience as well as near 32mpg on the highway. A distinct chrome grille, iconic star, and unique alloy wheels enhance the stunning silhouette of our C-Class. Inside our C300, find a haven of comfort and attention-to-detail, the cabin boasts sporty sophistication that will more than please you. Enjoy comfortable heated seats, climate control, power accessories and more as you familiarize yourself with the straightforward technology such as the Mercedes-Benz COMAND interface, smartphone integration, and a premium sound system. In classic Mercedes-Benz style, the always-evolving safety leader has outdone themselves once again incorporating emergency communications, advanced airbags, stability/traction control, and Attention Assist, which automatically monitors the driver for fatigue. Distinguished performance, incomparable style, and state-of-the-art technology are what you expect from Mercedes-Benz and this Sedan will exceed your expectations! Print this page and call us Now... We Know You Will Enjoy Your Test Drive Towards Ownership! Inject some driving fun into your day with our 2015 Honda CR-V EX-L AWD SUV brought to you in Modern Steel Metallic! Powered by a 2.4 Liter 4 Cylinder that offers 185hp while connected to an innovative CVT with sport mode for fun passing maneuvers. This All Wheel Drive provides nearly 33mpg on the highway and is the ideal balance of size and capability. Blending comfort and sport with thoughtful touches inside and out to take on whatever your lifestyle requires. The sculpted and sleek body lines of our EX-L are enhanced with LED daytime running lights, alloy wheels, and a beautiful sunroof. The sophisticated styling of this EX-L was built with your busy lifestyle in mind. Enjoy a high-resolution touchscreen, HondaLink, Bluetooth, SMS Text message function, a great audio system with a sub-woofer and Pandora compatibility. An illuminated steering wheel with cruise, audio, phone and i-MID controls keeps power at your fingertips. Of course, with comfortable heated leather-trimmed front seats, keyless entry, massive cargo space and 60/40 split rear seats the CR-V can handle your family and everything they need for their many adventures! Masterfully built with advanced capability engineering, a backup camera, Honda LaneWatch, vehicle stability assist with traction control, excellent outward visibility, and an army of airbags, this Honda CR-V EX-L is unparalleled in safety. Get behind the wheel and begin your newest adventure today! Print this page and call us Now... We Know You Will Enjoy Your Test Drive Towards Ownership! Load up the family and enjoy our award-winning One Owner 2016 Honda CR-V EX AWD proudly presented in Modern Steel Metallic! Powered by a 2.4 Liter 4 Cylinder that offers 185hp while connected to a CVT with sport mode. This All Wheel Drive rewards you with near 31mpg on the highway offering the ideal balance of size and capability ready to take on whatever your lifestyle requires! The simple, yet elegant lines of our CR-V EX are beautifully enhanced by LED daytime running lights, alloy wheels and a sunroof. Built with your busy lifestyle in mind, the EX interior greets you with everything you desire including push-button start, heated front seats, a high-resolution touchscreen, HondaLink, SMS Text message function, Bluetooth, a great audio system and Pandora compatibility, while an illuminated steering wheel with cruise, audio, phone, and i-MID controls keeps power at your fingertips. Of course, with massive cargo space, a retractable cargo area cover, and 60/40 split rear seats, the CR-V can handle your family and everything they need for their many adventures! Built to a standard befitting its stellar reputation, our Honda CR-V is well-equipped with a multi-angle rearview camera, Honda LaneWatch, vehicle stability assist with traction control, excellent outward visibility, and advanced airbags. Print this page and call us Now... We Know You Will Enjoy Your Test Drive Towards Ownership! Load up the family and enjoy our award-winning 2016 Honda CR-V EX AWD SUV proudly presented in Modern Steel Metallic! Powered by a proven 2.4 Liter 4 Cylinder that offers 185hp while paired with an innovative CVT with sport mode for easy passing. This All Wheel Drive rewards you with near 31mpg on the highway plus the confidence to go anywhere. The ideal balance of size and capability, this CR-V is ready to take on whatever your lifestyle requires! The simple, yet elegant lines of our CR-V EX are beautifully enhanced by LED daytime running lights, alloy wheels, and a sunroof. Built with your busy lifestyle in mind, the EX interior greets you with everything you desire including push-button start, heated front seats, a high-resolution touchscreen, HondaLink, SMS Text message function, Bluetooth. Add in a great audio system and Pandora compatibility, while an illuminated steering wheel with cruise, audio, phone and i-MID controls keeps power at your fingertips. Of course, with massive cargo space, a retractable cargo area cover, and 60/40 split rear seats, the CR-V can handle your family and everything they need for their many adventures! Built to a standard befitting its stellar reputation, our Honda CR-V is well-equipped with a multi-angle rearview camera, Honda LaneWatch; vehicle stability assists with traction control, excellent outward visibility, and advanced airbags. Print this page and call us Now... We Know You Will Enjoy Your Test Drive Towards Ownership! Don't wait to experience our 2016 Honda CR-V LX AWD in White Diamond Pearl! Powered by a proven 2.4 Liter 4 Cylinder that offers 185hp while connected to a CVT with sport mode reward you with easy passing maneuvers. An ideal balance of size and capability, our All Wheel Drive CR-V is ready to take on whatever your lifestyle requires even when road conditions are less than ideal while offering near 32mpg on the highway. With clean simple lines and sophisticated styling, our CR-V has classic good looks you will appreciate. Honda boasts excellent safety scores thanks to advanced capability engineering, vehicle stability assist with traction control, excellent outward visibility, rearview camera, and an army of airbags, this CR-V also provides you with priceless peace of mind. Get behind the wheel and begin your newest adventure today! Print this page and call us Now... We Know You Will Enjoy Your Test Drive Towards Ownership! Our 2015 Honda CR-V EX AWD SUV in Modern Steel Metallic is better than ever! Powered by a direct-injected 2.4 Liter 4 Cylinder that offers 185hp while connected to an innovative CVT with sport mode reward you with pleasing road manners. This sure-footed All Wheel Drive CR-V is the ideal balance of size and capability, blending comfort and sport while showing off near 34mpg on the highway. The sculpted and sleek body lines of our EX are enhanced with LED Daytime Running Lights, 17-inch alloy wheels and a sunroof. The sophisticated styling of the EX interior was built with your busy lifestyle in mind. Enjoy heated front seats, a high-resolution touchscreen, HondaLink, Bluetooth, SMS Text message function, a great audio system, and Pandora compatibility. An illuminated steering wheel with cruise, audio, phone and i-MID controls keeps power at your fingertips. Of course, with massive cargo space and 60/40 split rear seats, the CR-V can handle your family and everything they need for their many adventures! Masterfully built by Honda with advanced capability engineering, a rearview camera, Honda LaneWatch, vehicle stability assist with traction control, excellent outward visibility, and an army of airbags, this CR-V is unparalleled in safety. You'll feel confident knowing that it can safely keep up with your family. Get behind the wheel and begin your newest adventure today! Print this page and call us Now... We Know You Will Enjoy Your Test Drive Towards Ownership! A favorite among drivers and critics alike, our 2016 Honda Accord Sport Sedan in Modern Steel Metallic is the intelligent choice! Powered by a proven 2.4 Liter 4 Cylinder that offers 189hp while managed by a paddle-shifted CVT that allows a smooth and responsive drive. This Front Wheel Drive offers near 35mpg on the highway while enhanced by a distinct grille, dual exhaust, and LED taillights. The high-quality Sport interior offers ample passenger space and comfort for all with supportive seats, a 60/40 split-folding rear seat, dual-zone automatic climate control, full power accessories, and a prominent high-resolution infotainment display. It's easy to stay safety connected thanks to Bluetooth phone and audio, SMS text message function, and a terrific sound system with CD, auxiliary audio jack, and Pandora compatibility. Our Honda received top safety scores thanks in part to advanced compatibility engineering body structure, a multi-angle rearview camera, vehicle stability assist with traction control and other advanced safety features. With a sterling reputation for reliability, security, performance and classic style, our Accord Sedan is most certainly a wise choice! Print this page and call us Now... We Know You Will Enjoy Your Test Drive Towards Ownership! You'll love the way you feel in our luxurious 2016 Nissan Altima 2.5 SL presented in Super Black! The heart of our sedan is a 2.5 Liter 4 Cylinder producing 182hp that's perfectly paired with a CVT. This Front Wheel Drive winning combination works together beautifully; offering a crisp punch with plenty of get-up-and-go while scoring near 40mpg on the highway. Make a powerful first impression in your fresh-faced Altima 2.5 SL with its sculpted lines and classically elegant profile that is complemented by a sunroof, alloy wheels, and unique halogen headlamps with a projector-type lens. Inside our Altima 2.5 SL, you are treated to modern conveniences and top-shelf amenities that are sure to make you smile. Remote engine start, push-button start, a gorgeous leather interior with heated front seats, Bluetooth, an Advanced Drive-Assist Display, NissanConnect with mobile apps, and Bose premium audio with a color display make every ride feel first class. Take a moment to admire our photos and you'll notice the interior is spacious and thoughtfully designed to meet your demands. A Top Safety Pick, our Nissan Altima takes care of you with innovative safety features such as Active Understeer Control, blind spot warning, rear cross traffic alert, automatic headlights, stability/traction control, rearview camera, and advanced airbags. Blending fuel economy, performance, comfort, and safety, this Altima delivers a smile and sense of confidence that will make you stand out from the crowd. Print this page and call us Now... We Know You Will Enjoy Your Test Drive Towards Ownership! Presented in Predawn Gray Mica, our 2016 Toyota Camry XLE Sedan is an absolute show-stopper; sporting bold sophistication and innovative design! Powered by a 2.5 Liter 4 Cylinder that offers 178hp while paired with a smooth-shifting 6 Speed Automatic transmission. This Front Wheel Drive rewards you with nearly 35mpg on the open road along with confident handling, straightforward technology, and lots of comfortable passenger space make this car an absolute delight to own. Every swoop and curve of our Camry has been masterfully crafted for optimal aerodynamics. Inside the XLE, ergonomically designed interior features are tailored to you with leather trimmed seats and dual-zone automatic climate control. Stay seamlessly connected via an Entune Audio touchscreen with Bluetooth and a six-speaker sound system with steering wheel mounted controls. You'll also appreciate remote keyless entry, cruise control, a rearview camera, a tilt-and-telescoping steering wheel, and split-folding rear seats. Our Modern Steel Metallic 2015 Honda Accord Sedan EX-L is a perfect traveling companion. Powered by an award-winning 2.4 Liter 4 Cylinder that offers 185hp while paired with a CVT for easy passing. Our Front Wheel Drive sedan provides responsive acceleration not found in other brands in its class plus scores near 36mpg on the open road. A bold grille, heated mirrors, LED brake lights and 17-inch wheels accent our refined EX-L. Sit back and enjoy the EX-L comfortable heated leather seats and the ambiance from the sunroof as well as smart entry, push-button start, and an auto-dimming rearview mirror. A central display communicates with the car's technology to be your official command center and to provide you with a personalized driving experience at your fingertips with steering wheel-mounted controls. Imagine yourself behind the wheel enjoying the convenience of Bluetooth or a premium 7-speaker sound system with a touchscreen display, available satellite radio, and smartphone app integration. Thanks to Honda's advanced compatibility engineering body structure, collision and lane departure warning and responsive braking, you can have the peace of mind knowing your precious cargo will be kept out of harm's way. The quality engineering behind this Accord makes it the obvious choice. Print this page and call us Now... We Know You Will Enjoy Your Test Drive Towards Ownership! True efficiency rewards you with our 2018 Toyota Camry LE Sedan offered in amazing Celestial Silver Metallic. Powered by a 2.5 Liter 4 Cylinder that produces 203hp while paired with an impeccable 8 Speed Automatic transmission for quick acceleration. Impress yourself and put this Front Wheel Drive Camry to the test on the open road while seeing nearly 39mpg. With a beautiful combination of athletic and graceful body styling, you will be immediately attracted to the Bi-LED automatic headlights, alluring alloy wheels, and bright LED taillights. Slide into your comfort zone of our Camry LE and take a seat in the fabric-trimmed seats as you savor ergonomically designed features including a 7-inch touchscreen display, Entune 3.0 Audio, Bluetooth, and a wonderful six-speaker sound system with steering wheel mounted controls. You'll also appreciate remote keyless entry, cruise control, a rearview camera, a tilt-and-telescoping steering wheel and split-folding rear seats. Stunning looks, amazing handling, the newest technology and the roomy interior make this Camry an absolute joy to own. This Toyota has an abundance of safety features including Anti-lock brakes with brake assist, stability control, and an army of 10 airbags combine to safeguard you in this impeccable Toyota with a sterling reputation for reliability. Enjoy this smooth quiet ride! Print this page and call us Now... We Know You Will Enjoy Your Test Drive Towards Ownership! Eye-catching in Summit White, our 2016 Chevrolet Malibu 2LT Sedan will impress you with its ideal blend of form and function! Powered by a TurboCharged 2.0 Liter EcoTec 4 Cylinder that offers 250hp while connected to an innovative 8 Speed Automatic transmission that offers proven fuel-saving technology. This Front Wheel Drive yields near 32mpg on the open road. Responsive and sporty, our sedan rewards you with driving pleasure and ultimate comfort with stunning good looks to match! Take a moment to admire the fresh-faced windswept silhouette of our Chevrolet Malibu 2LT. Inside the thoughtfully crafted 2LT cabin with everything perfectly in place as if you had designed it yourself! Settle into the supportive seats and enjoy amenities including remote vehicle start, steering wheel mounted controls for audio/phone/cruise, a rear vision camera, a color driver information display, and a convenient rear 60/40 split folding seat. Stay connected to your digital world with available WiFi, wireless charging for devices, and the Chevrolet MyLink touchscreen with available satellite radio. Your safety is paramount to Chevrolet as demonstrated by LED daytime running lights, ten advanced airbags, park assist, forward collision alert, lane keeping assist, a tire pressure monitor, stability/traction control, and more. You desire sharp styling, a spacious interior, innovation, efficiency paired with performance, and incredible safety ratings...and our Malibu delivers! This is a well-rounded sedan that will meet all of your needs so...Print this page and call us Now... We Know You Will Enjoy Your Test Drive Towards Ownership! You can't help but admire our 2016 Toyota Camry SE Sedan shown in Predawn Gray Mica. Powered by a proven 2.5 Liter 4 Cylinder offering 178hp while paired with a responsive 6 Speed Automatic transmission for smooth shifts. This Front Wheel Drive SE rewards you with nearly 35mpg on the open road plus supplies confident handling, straightforward technology, and lots of comfortable passenger space make this car an absolute delight to own. Every swoop and curve of our Camry SE has been masterfully crafted for optimal aerodynamics. Check out the alloy wheels with a graphite finish and piano-black sport mesh lower front grille! Add some versatility and style to your day with our 2014 Honda CR-V LX AWD shown in spectacular Alabaster Silver Metallic! Powered by a 2.4 Liter 4 Cylinder that generates 185hp with its smooth-shifting 5 Speed Automatic transmission. Blending sport and comfort with thoughtful touches inside and out, this sure-footed All Wheel Drive SUV is capable of handling all your needs and rewards you with near 30mpg on the highway. The distinct grille and sleek stance inspire confidence at every turn. Inside our LX, a central display serves as your personal command center to give you a customized driving experience and power is literally at your fingertips with illuminated steering wheel-mounted controls. You'll appreciate Bluetooth, power locks/windows, supportive seating, and plenty of cupholders. Of course, with massive cargo space and 60/40 split rear seats, this CR-V can handle your family and everything they need for their many adventures! Masterfully built with Honda advanced capability engineering, vehicle stability assist with traction control, a backup camera, excellent outward visibility, and an army of airbags, the CR-V is unparalleled in safety. Reliable, comfortable, and safe - it can do it all! Get behind the wheel and begin your newest adventure today! Print this page and call us Now... We Know You Will Enjoy Your Test Drive Towards Ownership!